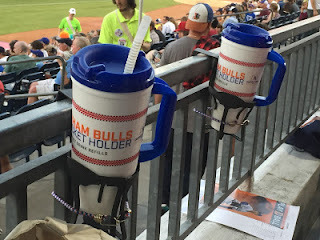 Each year Watching Durham Bulls Baseball recognizes the hitter and pitcher who have spent the least amount of time in a Durham Bulls uniform. The award is named in honor of North Carolinian Archibald “Moonlight” Graham who famously played only two innings for the New York Giants in 1905, never coming to bat. We have just a few criteria for selection, all negative. Not considered are players who come through on a rehab assignment, played only in post-season (did not apply this year, obviously), or (for the pitcher) a position player thrown to the wolves at the end of a game. Congratulations to Alec and Kyle! Good luck in 2017! Archibald “Moonlight” Graham achieved lasting fame as a character in the W.P. Kinsella novel, Shoeless Joe, and then became even more famous when he was played by Burt Lancaster (and Frank Whaley) in the Kevin Costner film, Field of Dreams. 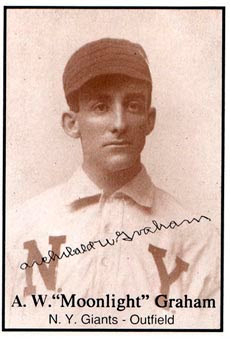 As a ballplayer, Graham played two innings in the major leagues as a right fielder for the New York Giants in 1905. He never came to bat. You can look it up. He went on to a career as a well-loved physician in Chisholm, Minnesota. Of interest to us is that he was a North Carolina native (born in Fayetteville, grew up in Charlotte); graduated from UNC (where he played baseball); and was the older brother to UNC President and US Senator Frank Porter Graham. If you find him an intriguing character, the Wikipedia article is a good start. There’s a nice NBC piece done on him a few years ago. And then there’s a terrific book by Fayetteville writer (and Bulls fan) Brett Friedlander and Robert Reisling, Chasing Moonlight. Copies of the book are in the Wake and Durham County Library systems and Amazon. Canadian author W.P. Kinsella recently died and was remembered at his website and elsewhere. This is Part 5 of our 2016 wrap-up. Part 1- The Team is here; Part 2 - The Pitchers is here; Part 3 - the Hitters is here, and Part 4 - the Tampa Bay Rays is here. 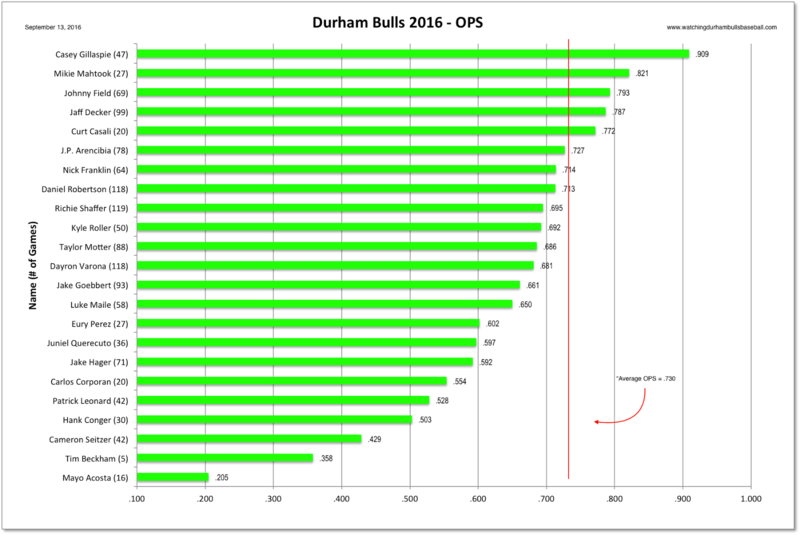 As usual, the Durham Bulls staff and management did a terrific job this year. Please jump in with your comments. The most visible change this year was the extension of netting from just behind home plate out to the edges of the dugouts. We sit on the front row of the terrace view section behind the first base dugout, so netting did change our view of the game. At first, it bothered me. However, I have to say that for years what bothered me much, much more were inattentive parents among us. I've seen children sitting on top of the dugout with their back to the game! And that was even more distracting to me than the netting has been this year. Plus, our seats are pretty far back, unlike the netting in the old Durham Athletic Park, which feels like a cage. Not a high point this year. After the extreme efforts of a couple of years ago, we expected better. Hasn't happened yet, although the field certainly drains better. A key problem was probably overuse of the field, first by Trinity College (sometimes referred to as Duke University) and then by the ACC tournament. It did seem to play well, but here's hoping they find the right mixture of grass species and usage so that appearances are better next year. I am no expert on beers, but the variety available, including a microbrewery right in the ballpark, seems to be superb. Similarly, when you go to as many games as we do, you can't eat too much ballpark food without turning into a blimp. However, the loss of Rise Donuts pained me. I know they had a poor location and who (other than I) goes to the ballpark for a donut? On the other hand, my other favorite, Durham Coop Market, is still there. I hope they made money and will be back. Overall I'd say there's a tick upwards since Bull City Hospitality took over food operations. I have grown to really like Patrick Kinas as the Bulls broadcaster and am very impressed with the growth of Scott Pose as the color commentator for most of the home games. They make a very good team. Kinas went off to work the Rio Olympics for a couple of weeks and Pose did a very credible job backing up a stream of stand-ins. And then there's the Post 50 TV crew, who set a very high bar for everyone in Triple-A baseball. I often check in on the Bulls when they are on the road via MiLB-TV. There I see what the home team is streaming and listen to their broadcast team is up to. Some are awful, some are OK, none of their TV operations come close to what Post 50 does. Just a few more watts of transmitting power would be nice for my little radio in the park and for those useless embedded antennas in modern automobiles. Plus, Kinas did a daily interview of Bulls manager Jared Sandberg that was aired in the pre-game show. We were not able to listen every day and it sure would have been nice to have those interviews available as podcasts. In particular, the Rays are obsessively secretive about player injury status, but they will answer questions ... if asked. And Kinas often does ask. But if you're not listening in that moment, you simply don't know what's up. I get more information about Bulls players status from the Tampa Bay Times than I do from either the Bulls front office or the local paper, the Durham Herald-Sun. Does a very good job, particularly on stats, little essays for the programs, and this year's set of "Arrival" videos. This year's fan appreciation video was well done. All the between innings promotions get a bit old for folks who come to a lot of games. We are going to miss Bill Law. See the tributes here. For several years there was a pre-season "Meet the Team" luncheon for season ticket holders and sponsors. That's gone away. Too bad. Although we've solved the cupholder problem for the front row seats of Terrace View, even I would admit that it looks awfully ratty. Lastly, the ACC has pulled its tournament from Durham for 2017. Here's the Bulls' response. DURHAM, NC – Our partners at the Atlantic Coast Conference had a difficult decision to make regarding the location of neutral site championships throughout the state of North Carolina. We understand the conference’s position, and support our partner’s decision to remove those championships from North Carolina. We look forward to a resolution of this issue, so that we can welcome the tournament back to Durham in future years. We have opposed House Bill 2 from the beginning, and continue to share that sentiment. Good for the Bulls! We too share that sentiment. This is Part 4 of our 2016 wrap-up. 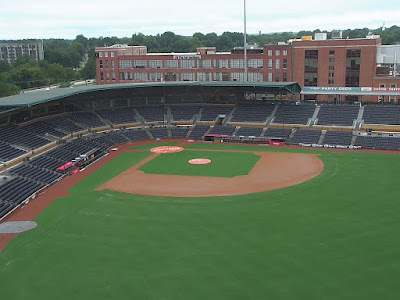 Here are the links to Part 1, 2, 3. and Part 5, The DBAP. The Tampa Bay Rays are the Bulls' parent club. So, what about them Rays? 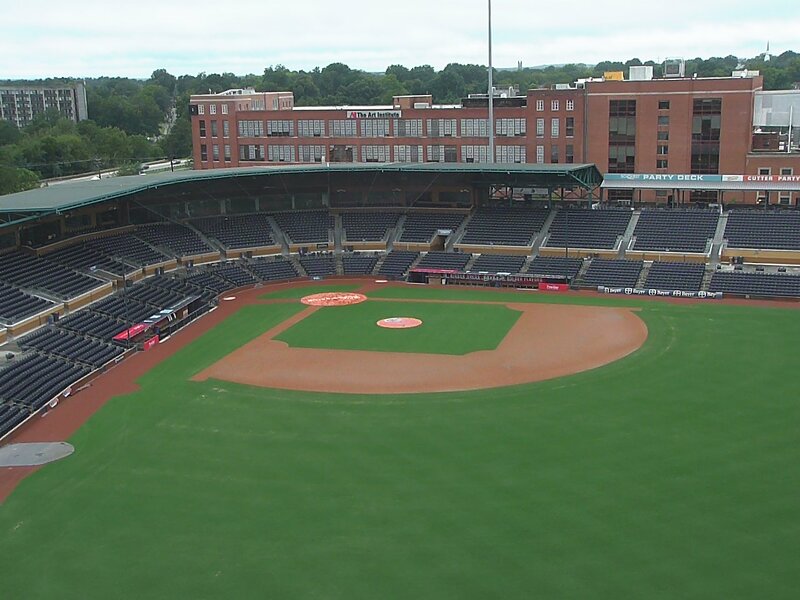 But we are interested in the Durham Bulls. 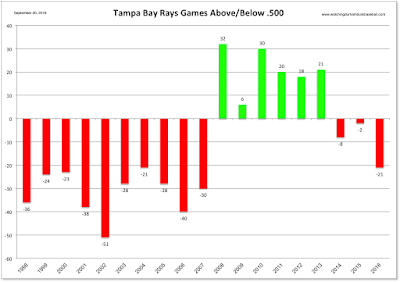 Our view is that there are some systemic problems with the Rays and that those problems are having an effect on both teams. The issues show up in 1) player development, 2) selecting and managing/coaching veteran players, and 3) overall managing/coaching. For example, so far this season, up in Tampa Bay, if you look at games played by position players [BaseballRef], of the top 7 players only two (Evan Longoria and Kevin Kiermaier) came up through the Rays system and played in Durham. Of the next seven, 3 players (Desmond Jennings, Tim Beckham, and Mikie Mahtook) came up through the Rays system and two others from outside the Rays system (Nick Franklin and Brandon Guyer) spent some time with the Bulls. 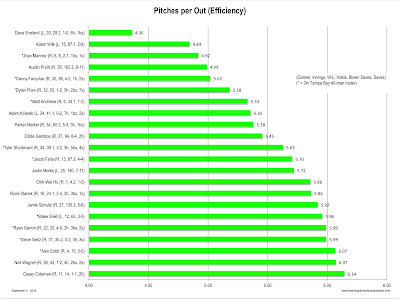 For pitchers, the picture is slightly better. 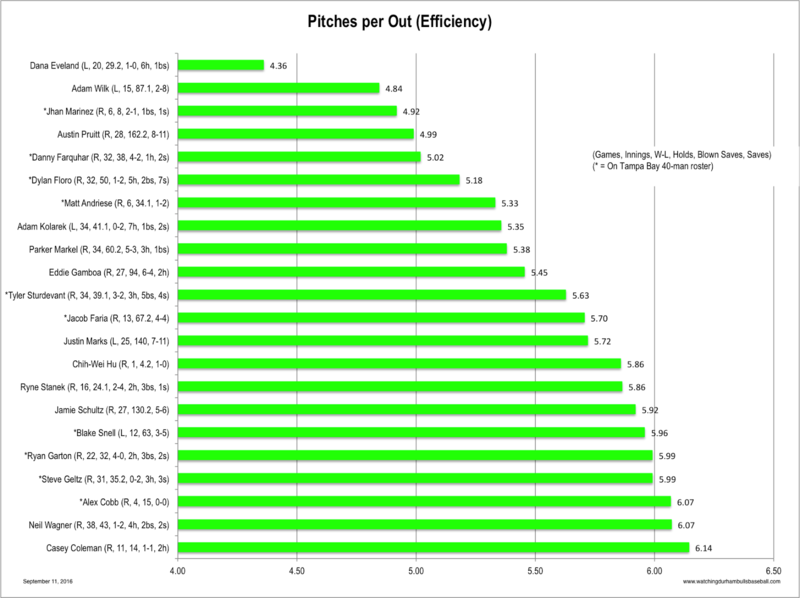 Of the 24 (so far) pitchers in Rays' games, seven (the traded-off Matt Moore, late-season call-up Blake Snell, returned from rehab Alex Cobb, and relievers Alex Colome, Ryan Garton, Dylan Floro, and Enny Romero) came through the Rays system. Plus almost all of the rest we've seen in Durham one time or another. Does the fact that not many ex-Bulls are playing for the Rays help explain why the Bulls have not been very good these last few years? Well, maybe. But that's certainly not all of the picture. As important is probably that they are not doing a very good job of spotting or managing veteran talent. 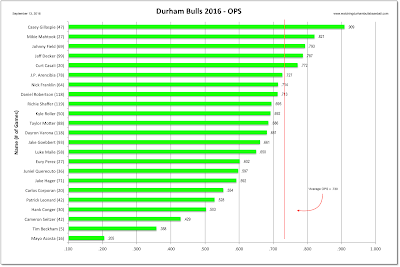 Back in 2013 (with a lot of help) we put together some stats on "greatest" Durham Bulls. (here, here, and here). Unless you happen to be a thorough-going baseball fanatic, you may not recognize many of those names. But Bulls fans do. Our concern is that, without diving into the data too deeply, it doesn't look like any names could be added in the three years since we made up the list. What does that mean? It means that the Rays are not seeking out and finding quality ballplayers to fill out the Bulls' roster. Just exactly what did Kyle Roller, Jake Goebbert, Eury Perez and Carlos Corporan bring to the 2016 Bulls? About as much as 2015's Eugenio Valez, Bobby Wilson, Grady Sizemore, Jose Constanza, and Alexi Casilla. Only Casilla's OPS of .827 is particularly respectable among that bunch, and he got dumped in mid-season. Then there was the using playing for the Bulls as a "punishment" at the end of the season. Two players on the 40-man were sent down and not recalled after the Bulls season ended, reportedly because the Rays didn't want them around. What does that say about being a Durham Bull? Management? The record speaks for itself. How much difference does a management crew make? We have witnessed three of the Bulls losing seasons and if there's a thread it's that the "veterans" didn't contribute as much as they could/should. We fans expect the youngsters to have growing pains. But we also expect the veterans to come up with the timely double play, home run, accurate throw from the field, and smart base-running moment that wins games. And a competent job of pitching. However, even veterans need solid coaching and managing. Is coaching/managing another thread that's running throughout the Rays system as an issue? Begins to look like it. 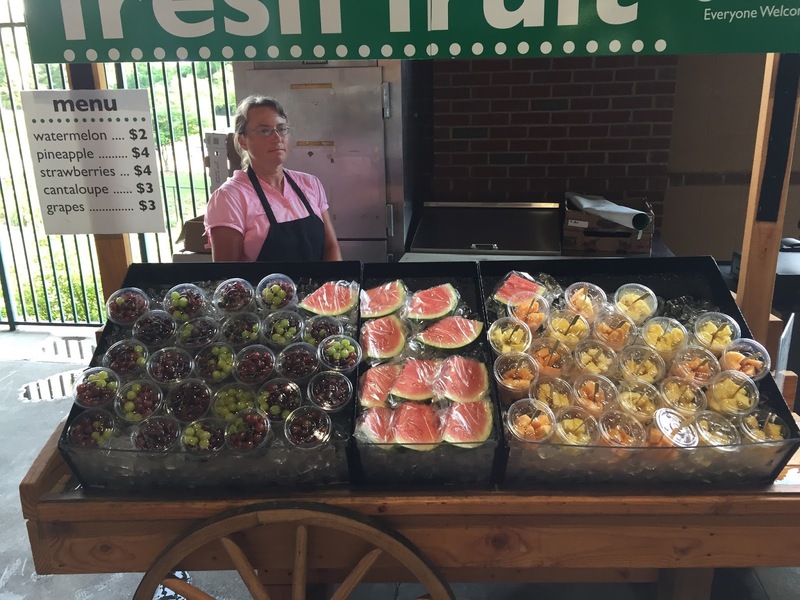 The final best-of-five began Tuesday in Pennsylvania, then moved to Georgia yesterday. The Braves are on the edge. They are behind 2-1 to the Yankee's franchise. A quirky, minor league playoff typical loss for the Braves. Their pitching crew walked in the tieing and winning runs (after putting all of the runners on based with hit-by-pitch or walk). 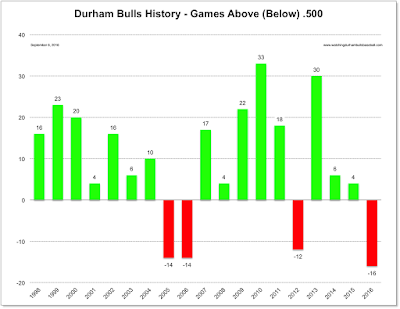 As we pointed out in Part 1 of this series, the Bulls hitting was pretty dismal this year. In fact, taken in the aggregate, it was the lack of hitting, more than any other factor, that made this the worst season in Bulls' history. We discussed the pitching at Part 2. See also Part 4 - The Tampa Bay Rays, and Part 5 - The DBAP. The Bulls saw 28 different batters come to the plate this year. Two of those were pitchers, Dana Eveland and Eddie Gamboa, only had one plate appearance. Two were short-term rehab assignments, infielders Matt Duffy for 3 games and Logan Forsyth for 2 games. A young minor leaguer, Alec Sole was in three games. We do need to point out that in his one at-bat pitcher Eddie Gamboa got a hit and scored a run ending up with the team-best batting average of 1.000 and OPS of 2.000! Looking at this chart of OPS numbers we see that we that we have to reach down to the 4th player in the rank-ordering before we find a player above the "average" line and who who had any significant amount of playing time (Jaff Decker). There was, however, a cluster of promising young players that we'd hope to see again next year: Casey Gillaspie, Johhny Field, Daniel Robertson, and "veteran" 26 year-old Jaff Decker. This table is sorted by a more "advanced" stat, Weighted On-Base Average (wOBA) and includes another stat, Weighted Runs Above Average (wRAA) that gives us a hint of the player's contribution to the team this year. Players are discussed in order of games played. "Slash Line" is Batting Average/On Base Percentage/Slugging Percentage. The Bulls played a 144 game season that ended September 5, 2016. Update: Decker put on 40-man and called up to Rays mid-September. Update (9/12/2016): Added to 40-man roster and called up. Mayo Acosta is essentially the Bulls bullpen catcher. He has been on and off the roster for the last four years, essentially succeeding Craig Albernaz in that role (Albernaz, by the way, is with the Rays' Hudson Valley Renegades as their hitting coach). Tim Beckham got in 5 games and 12 plate appearances at the end of the season. Matt Duffy, an infielder, had 12 plate appearances on a rehab assignment. Alec Sole visited for three games in August while he was enroute from the Charlotte Stone Crabs to end the season with 6 games with the Montgomery Biscuits. Logan Forsyth had two games on a rehab assignment. Thirty-four different players pitched for the Durham Bulls this year. As a group, they were not a particularly impressive crew. Our previous post set out some of the aggregate numbers. This one will take a look at individuals. In Part 3, we discuss the hitters, in Part 4, the Tampa Bay Rays, and in Part 5, the DBAP. The 34 pitchers included four position players: Dayron Verona (1 appearance, 1 inning), Cameron Seitzer (2 appearances, 1.2 innings), Jaff Decker (2 appearances, 2 innings), and Mayo Acosta (2 appearances, 2 innings). For the rest, we'll go over them one by one in order of innings pitched, throwing a few charts in along the way. Alex Cobb (right-handed starter) joined the Bulls for 4 rehabilitation appearances (15 innings). I'd like to complain about how that punched a hole in the Bulls' rotation and caused other problems. However, by the time he showed up in August the Bulls were already doomed. He spent parts of 2011 and 2012 with the Bulls and we wish him only the best in his continued recovery. Andrew Bellatti (right-handed reliever) started the season with the Bulls and made 6 appearances for 5.1 innings. He went on the disabled list in May, was DFA'd in June and may be out of baseball now. Brad Boxberger (right-handed reliever) put in 1.2 innings in two rehab appearances in May. 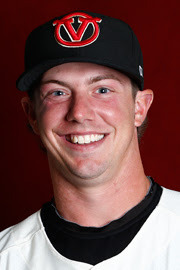 Kyle Winkler (right-handed reliever) came up from Montgomery for one appearance on July 9, pitched 1.1 innings, and got a win before going back to Montgomery. The first round of the International League Governors' Cup playoffs has finished with the improbable Gwinnett Braves winning over the once inevitable Columbus Clippers. The finals, a best of five series starts Sep 13 at Scranton/Wilkes-Barre. The RailRiders swept the IronPigs in their three games. 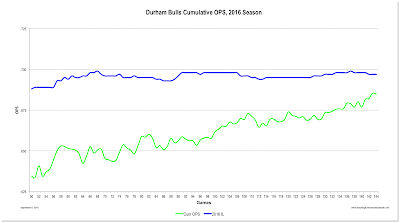 This is the first of several posts where we review the 2016 Durham Bulls season. We'll start with some overall team stats, then take a look at individual players. 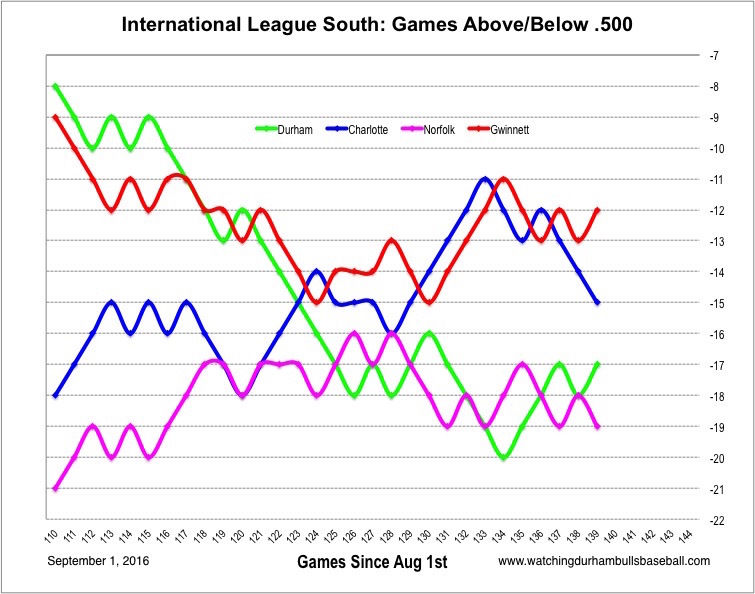 Overall, this was not a good year for the Durham Bulls. 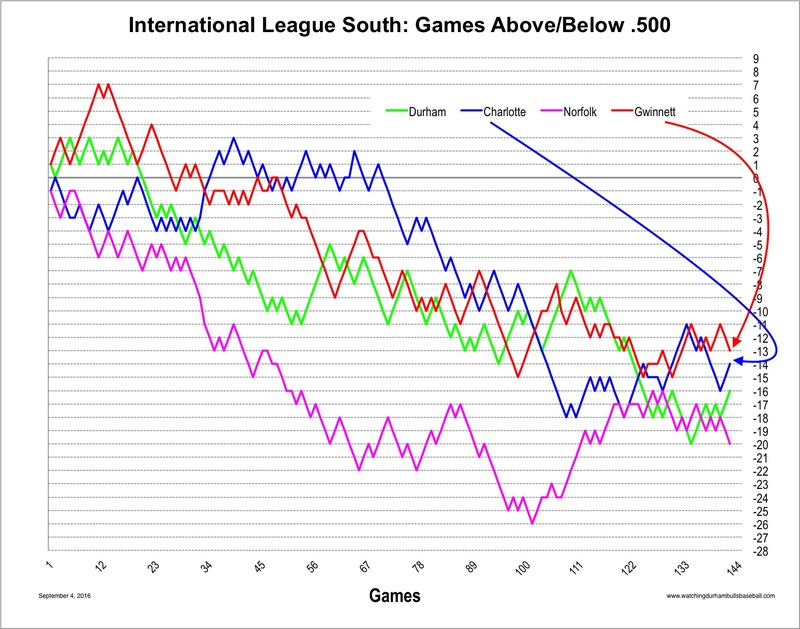 At 20 games into the season they dropped below .500 and never got back. There was a moment, however, at the end of July that they had a clear shot at winning the IL South Division. But they fell off the edge and never recovered. See also Part 2 - The Pitchers, Part 3 - The Hitters, Part 4 - The Tampa Bay Rays, and Part 5 - The DBAP. How bad was it? 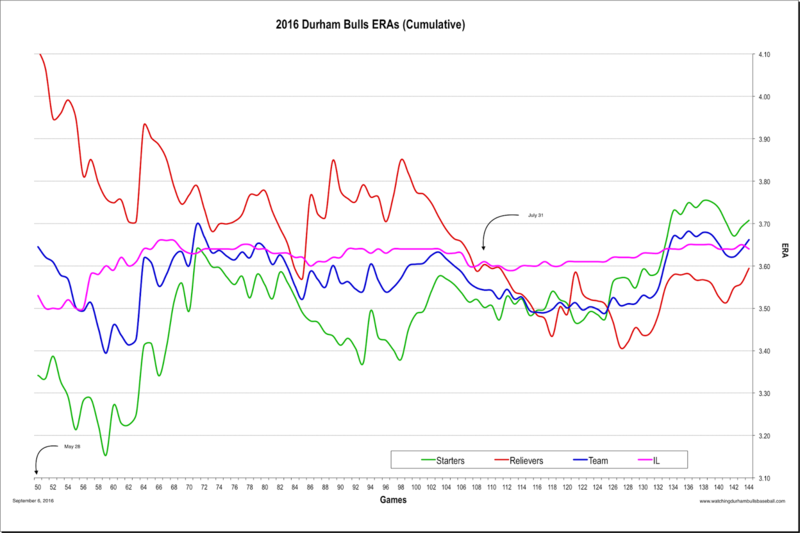 Well, let's just point out that this was the worst year in Triple-A history of the Durham Bulls. Overall, pitching was decent this year. 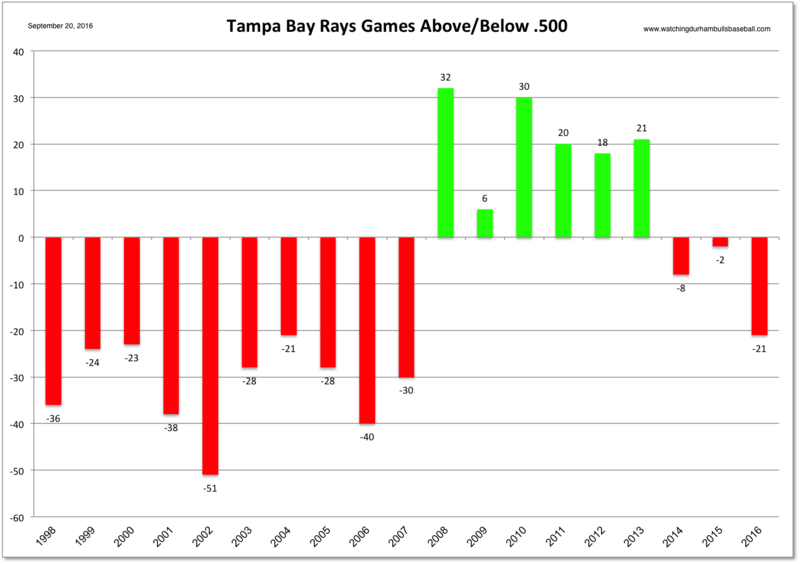 As the chart shows, the relief crew was not very good for much of the year; however, the team average ERA stayed below the IL average. 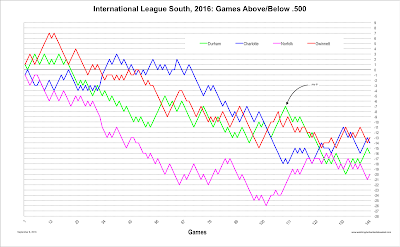 At the end of the year the team ERA of 3.67 ranked 7th in the International League. This was not a stable crew. 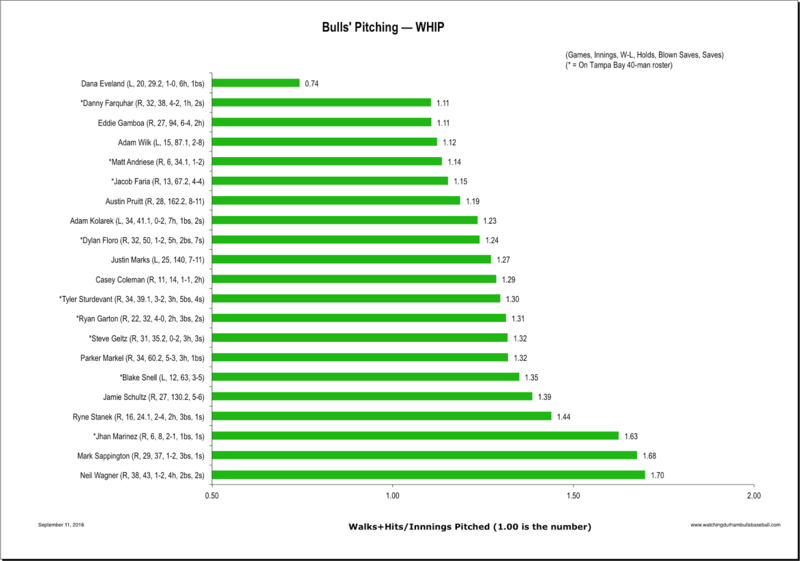 The Bulls saw 34 different pitchers take the mound. That included four position players and a couple of rehabs. On balance, however, we have to say that pitching was not the problem in 2016. 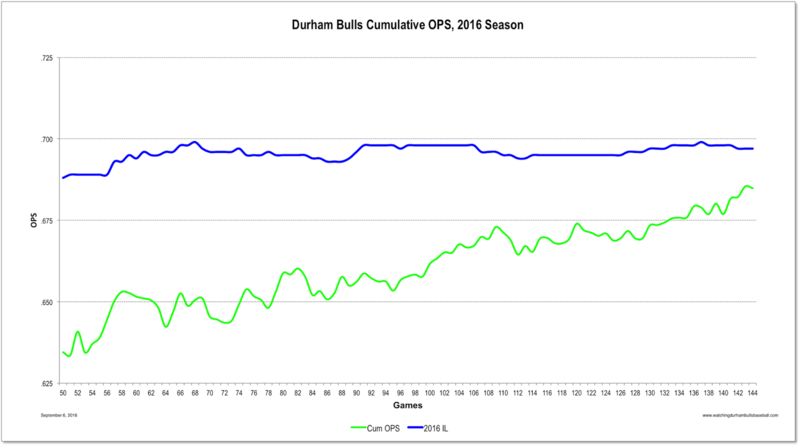 Durham Bulls hitting in 2016 in a word — awful. 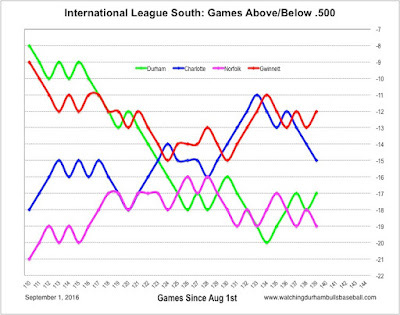 Their end of year OPS was .685, 12th in the 14-team International League and .047 behind the league leader Scranton/Wilkes-Barre. Their batting average was a dismal .238 tied for worst in the league with the Syracuse Chiefs. Of the 23 players who came to bat this year (two of them were pitchers with just one plate appearance each), only three played in over 100 games. The best of the bunch was infielder Daniel Robertson who hit .259 with 43 RBI and a decent OPS of .713. Geek stuff comment: I chose OPS since folks are reasonably familiar with the stat. Plus, when charted in this manner the curve matches the same curve for wOBA very well. 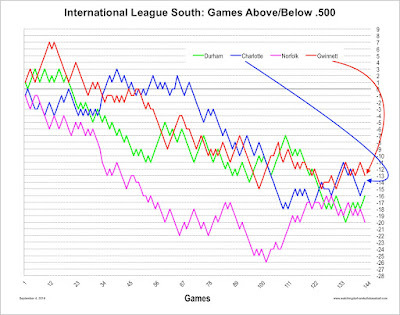 For an individual player, by the way, an OPS of .685 is characterized as falling between "poor" and "below average". 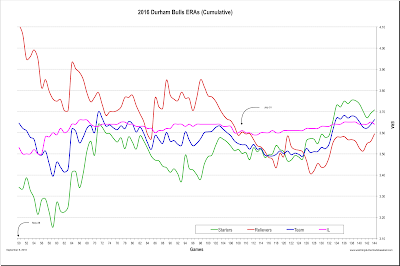 Obviously, early in the season the hitting was really bad and there was a steady improvement, but not enough to make up for the dropoff in pitching as season's end. To discuss defense we had to invent a stat since none of the ones I'm familiar with seemed to get at the issue. In midseason it just seemed like the Bulls were giving away a lot of games. 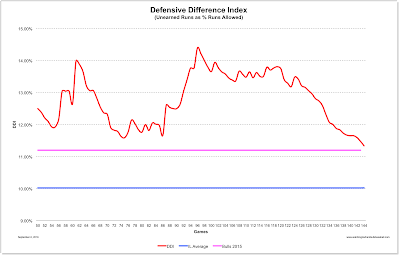 This is a very simple stat, "Defensive Difference Index". It is the running total of unearned runs as a percentage of all runs allowed. Seems to me that this measure accounts for the fact that a lot of mistakes such as wild pitches, errors, and passed balls don't end up making a difference. 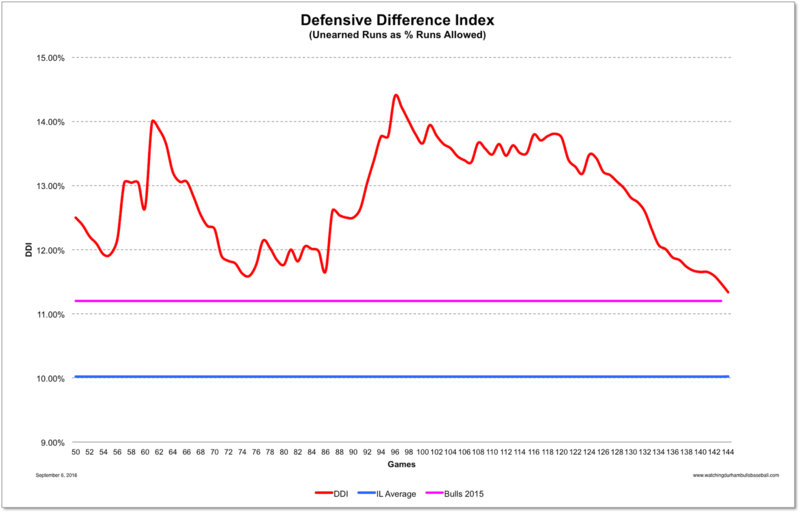 Here we see that the Bulls really weren't very good at defense this year, but certainly had a very good run near the end, bringing themselves down to near the IL average. How did they compare? Well, that's where this stat may have some problems. The Bulls were nearly the worst in the league. They ranked 12th out of 14. But the worst team in the league by this measure was the Scranton/Wilkes-Barre RailRiders, who won the North Division. The best team in the league was the Charlotte Knights, who did not do well at all. However, the Columbus Clippers, the best record in the IL, ranked #4. Guess that it means that it takes everything to have a winning team. Tampa Bay reached down into the Durham Bulls roster after yesterday's game and pulled a few guys up. Mostly expected, but a couple of surprises. Links here and here. Left-hander Justin Marks was the surprise. He's got a lot going for himself. He's thrown a ton of pitches (2,400) with little apparent ill effect. He's left-handed. He has some experience as a reliever. He's got a decent WHIP (1.27). His won-loss record of 7-11 wasn't stellar, but neither was the team behind him. And he's got that big no-hitter. Plus, 13 of his 25 starts had game scores of greater than 50. Good luck! Mikie Mahtook was no surprise at all. Here's hoping he gets some playing time. He's had a tough year. Richie Shaffer is in the same category. His season with the Bulls has shown only rare moments of flash. But some of those moments have been in August. Again, good luck to both. Steve Geltz was called back. We like him. We hope he does well enough to stick with the Rays into 2017. But who did not get called up? Yet. The two that stand out are infielders Tim Beckham and everyman Taylor Motter. Tampa Bay beat writer Mark Topkin speculates at the end of his article. Since the player for whom the Rays gave up Matt Moore, Matt Duffy (we saw him here on a rehab assignment), is out for the season, you'd think that one or both of these guys have a shot. To make room on the roster, Bulls catcher Hank Conger was designated for assignment. The only other Bulls on the 40-man are starting pitcher Jake Faria, who is probably done for the season, and reliever Tyler Sturdevant, who has been back-and-forth a lot this season. Some possibility that he could go back up. Lastly, Eddie Gamboa had a very solid three innings against the Orioles yesterday. Box. Good for him! 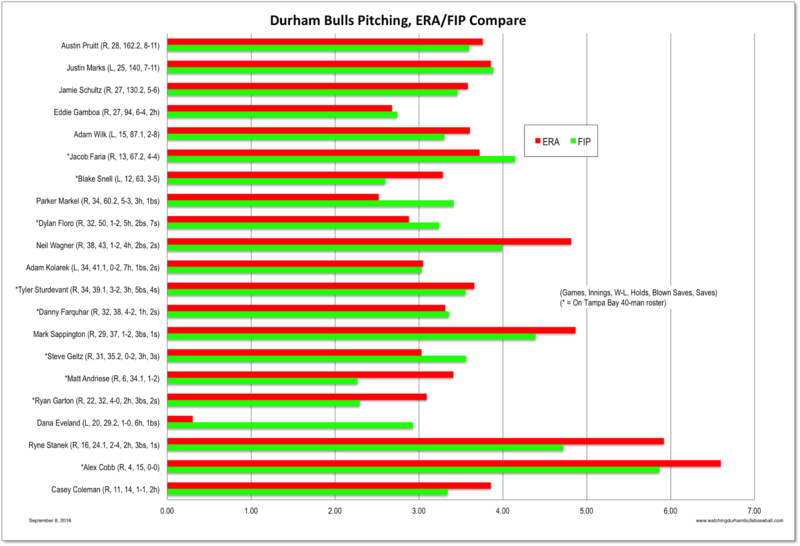 Most of this season Norfolk pitching gave the Bulls fits. They did again this last game of a season Durham Bulls fans are going to work at forgetting. Austin Pruitt did not have his best stuff and worked awfully hard in his four innings. Casey Gillaspie had a home run and ended the season at .307, a remarkable number for this year. Over the next several days we'll take a look at the whole season and the whole team. For now, let's just say that we wish all the Bulls the best of luck. Some will get a call-up, some will probably be playing winter ball, some will be back next year. “I’m going to be straight up with you. I played six years in the big leagues, last year I led this league in home runs and I did good in the big leagues when I got there and now I’m back in Triple-A,” said Arencibia, who before the game was presented with his second straight “Good Guy” media award. “If I’m going to have to play in Triple-A (again next year), I’m no longer going to play baseball. I believe that I’m a major league player. Last year he was mostly a first baseman and designated hitter. This year he was mostly a catcher and designated hitter. He was a good ballplayer on what is, let's face it, a third-rate ballclub. Plus he had to catch a knuckleballer in development. What we liked about him is that he simply seemed to be having fun out there. And from time to time he was inspired. Take yesterday. He had a very, very green young pitcher who'd just jumped from Single-A to Triple-A (Greg Harris) and he was having a tough time of it. J.P. was out there talking him through it every couple of minutes. That Harris got out of it with just three runs scored was a major accomplishment. At bat Arencibia was superb. His home run was pretty. His second hit, a single, was, in broadcaster Scott Pose's word, "buggywhipped" up into the wall. It was a pretty, pretty swing we just wish he'd had more of this year. Not to put words into his mouth, but seems to me that J.P. is saying that he isn't Crash Davis, he's a major leaguer. If he's not seen that way, then it's time to find some other way to have fun. J.P.: We loved watching you play baseball. 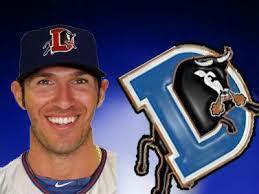 We liked seeing you in a Durham Bulls uniform. Good luck. Thanks for helping us through these last two years. The Biscuits are into their playoffs. The Bulls could not play themselves in to the playoffs, but the Braves are close to playing themselves out. The Norfolk Tides lost both games of a doubleheader to the Charlotte Knights and the Knights moved up to a 1/2 game of Gwinnett. And the last two games of the Knights' season are the Knights and Braves in Charlotte. One of those teams will win the Division. The Bulls, meanwhile, have come home for their final two games, playing the Norfolk Tides for third place in the South. 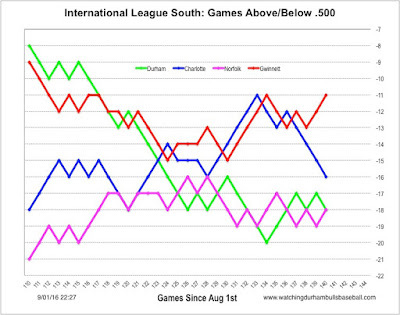 For more commentary on the Gwinnett Braves attendance woes see a late August article from the Gwinnett Daily Post (too close to Atlanta?). Playing to an empty stadium (1,175 paid, most left before the end), the Gwinnett Braves are within a game or so of clinching the South Division title. I've never understood why the Braves do so poorly. Doesn't auger well for the new major league stadium also going in north of Atlanta. Starting the game was reliever Dana Eveland, who improved his already stellar ERA to 0.32. The downside of Eddie Gamboa being called up was punching a hole in the Bulls rotation. The Bulls used six relievers. Sure hope the Rays put Gamboa to work soon. However, the Bulls could only come up with 2 hits over the 11 innings. For the 11th inning, we got to see the Bulls pull in an outfielder to set up a 5-man infield after the bases were loaded with no outs. Didn't work. This was the 18th shutout of the season for the Bulls hitting crew. On September 1 the major leagues can expand their active roster from 25 to 40. Tampa Bay rarely takes full advantage, but they did make several moves today (and a couple yesterday I haven't mentioned). Knuckleballer Eddie Gamboa. Very pleased to see Gamboa get the call. It will be his first. And the callup puts him on the 40-man roster as well. No word on who might be going off the Rays 40-man, but they might have had an open slot. Reliever Ryan Garton is going back up. He's been going back and forth all year. No surprise there. Reliever Steve Geltz was optioned back. We mentioned this morning that infielder Tim Beckham was optioned down. Grand Slam! Now for Hermine! The Bulls play the Braves three games in Georgia. Possible to catch up. Norfolk is playing in Charlotte. Charlotte could catch up as well. And then there's the hurricane that's coming ashore just south of Atlanta. The Bulls loaded the bases and/or got runners to third base several times Wednesday night. But the last time was the time that made the difference. Jayron Varona's grand slam (he was going for a sac fly, but oops!) won it all. The Bulls are traveling into the teeth of Hurricane Hermine (what kind of name is that?) to play Gwinnett for the South Division championship. The Braves are 2½ games ahead of the Bulls and they play three games down in Georgia. However, the hurricane is a'comin and there's little time left for makeup games. The challenge is to 1) play the games and 2) win the games they play. If they win just some of the games, then the Knights could sneak into the lead, and keep it. For as long as we've been going to Bulls games Bill Law was a presence. It's going to be odd not seeing him there anymore. RIP. Arizona Fall League info is out. We don't follow that at all, but notice that the manager of one of the teams is to be Jared Sandberg. The league has become primarily a AA prospect venue in recent years. Former Bull Tim Beckham has been playing sloppy ball with the Rays lately. So they are going to punish him by sending him to the Bulls! How great is that? So now the Bulls are a penal colony for recalcitrant shortstops? Or is he a first baseman now? I forget. More stories here and here. Of course, just a month ago Beckham was a hero. In a similar vein, former Bull Desmond Jennings has cleared waivers. No word yet on September callups.